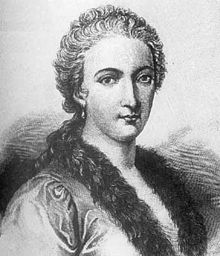 Maria Gaetana Agnesi (Italian pronunciation: [maˈriːa ɡaeˈtaːna aɲˈɲeːzi, -eːsi; -ɛːzi]; 16 Mey 1718 – 9 Januar 1799) wis an Italian mathematician, filosofer, theologian an humanitarian. She wis the first woman tae write a mathematics haundbeuk an the first woman appyntit as a Mathematics Professor at a Varsity. This page wis last eeditit on 17 Januar 2016, at 19:16.